With the labor market as tight as it has been decades the FOMCs focus is squarely on inflation. That makes this week an important for dollar traders because we’ll get a read on the FOMC as well as two key indicators of inflation, CPI and PPI. The read on the FOMC will come in the form of meeting minutes and will be scrutinized for signs of rate cuts and hikes. As for the data, both the CPI and PPI are expected to accelerate from the previous month which is a dollar-strong event. The question for traders is whether the strength is already factored into prices, and will the data be as better, worse, or as expected. The Dollar Index has been range bound for several months. This range is caused by shifting global sentiment, first negatively and then positively, and offsetting outlook for the world’s central banks. When one back lowers its forecast and another follows suit weakness in the first currency is offset by weakness in the second effectively creating a range-bound scenario. What we have now is an index wound up within its range and confirming resistance at the top of the range with crucial data on the horizon. 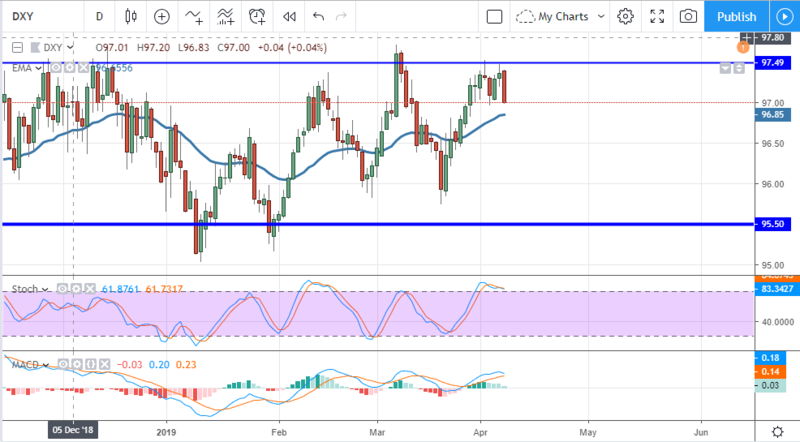 Currently, the DXY is forming a near-term double top confirming the $97.50 resistance target. This top is further confirmed by weakness in the indicators that shows a peak in prices. The caveat is that momentum is still bullish and stochastic is set up to fire a strong bullish crossover if the market is catalyzed appropriately. Possible catalysts may be found in either the minutes (a hawkish sounding FOMC) or the data should the data come in strong. Weaker than expected data or simply as expected data is not likely to do the job. 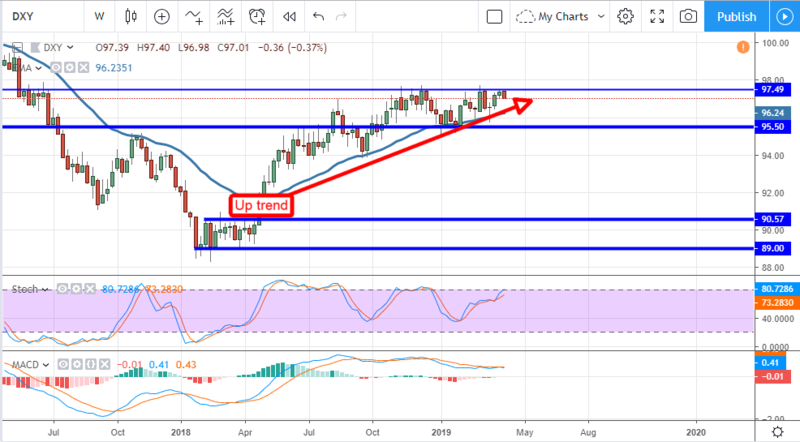 From the longer-term perspective, using the weekly charts, the DXY has been consolidating within a near-term range but is in an uptrend. The indicators are bullish and moving higher which suggests a test of resistance is brewing. A move above resistance, at $97.50, would be bullish and likely take the index well above $100. The next round of central bank meetings including the FOMC and ECB aren’t for another month. Until then the data will be the driver of this trade and there will be a lot of data. This week’s calendar is light other than what I’ve already mentioned, next week’s economic calendar includes key reads from the U.S., the EU and the UK (and don’t forget about the Brexit, scheduled for later this week).